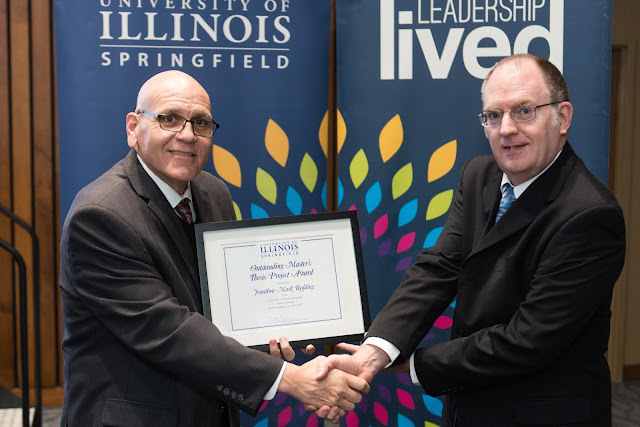 Clarice Ford, Ph.D., University of Illinois Springfield vice chancellor for student affairs, was named the 2018 recipient of the Outstanding Commitment in Education award by the Illinois State Treasurer’s Office. 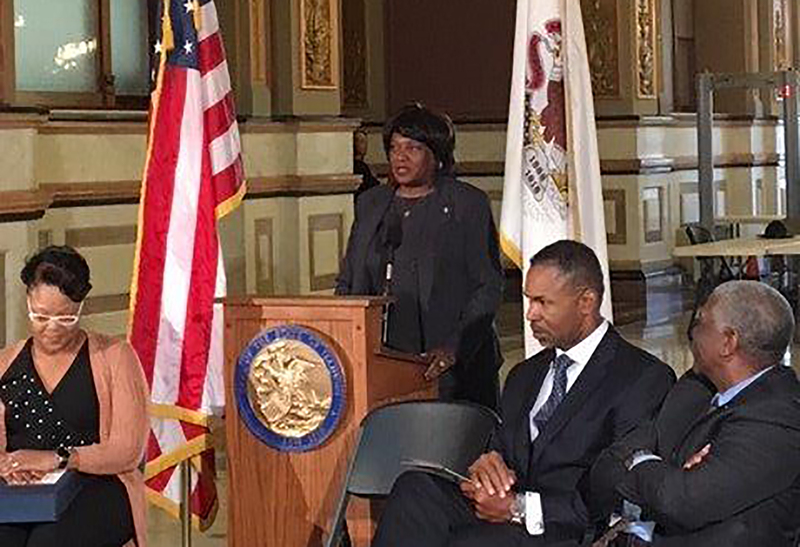 Ford was honored during a Black History Month Celebration held in the Illinois State Capitol Rotunda on Tuesday, February 27, 2018. Seven other local people were also recognized during the celebration for their outstanding contributions to the state of Illinois. Ford has been a member of the UIS community since 2008. She has served as the executive director of the UIS Diversity Center, associate dean of students and associate vice chancellor of student services. She earned her doctorate in educational leadership and change from the Fielding Institute in Santa Barbara, California. She holds a master’s degree in religious education and theology from Lincoln Christian Seminary and a master’s degree in adult education/multi-cultural education from Antioch University. She also received her bachelor’s degree in human services from Antioch University. Madison Stone says she’s glad she had a mentor to help her though her first year at the University of Illinois Springfield. Now a junior, Stone is giving back by mentoring four freshmen students in the Capital Scholars Honors Program. At UIS, Stone, a business administration major, is a shepherd and bible study leader for the Christian Student Fellowship (CSF), a member of the Society for Human Resource Management student chapter and interns at the UIS Human Resource Office. As part of CSF, she plans events on campus and helps recruit members by staffing tables at events, such as the Involvement Expo. “I like being a part of CSF because there are people from all stages – we have graduate students, international students – we’re all coming together for one purpose and seeing that on our campus is really cool,” she said. “I came on a campus visit to UIS and about 15 minutes into the visit I told my mom ‘this is where I’m going to school.’ I just remember being so in love with the environment and the size of the campus,” she said. 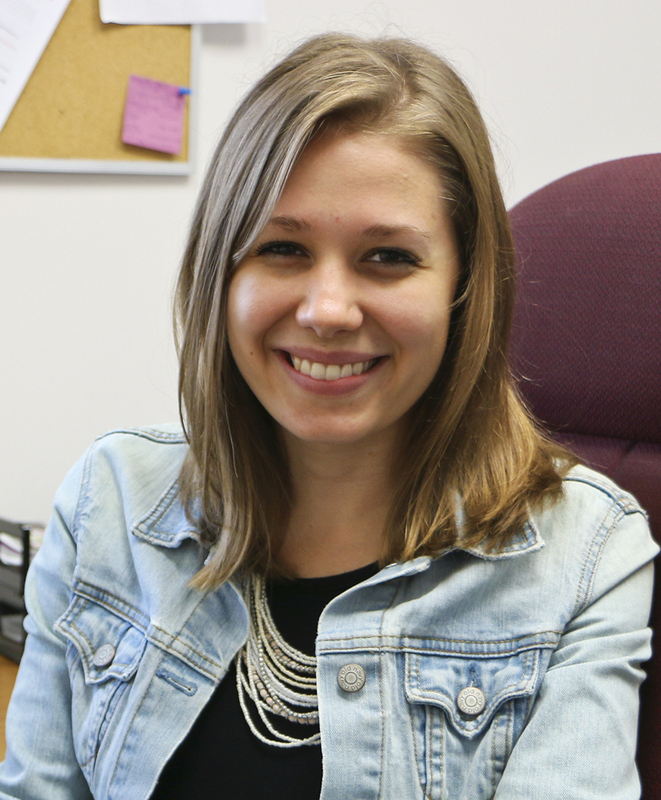 Following graduation from UIS, she plans to pursue a master’s degree while working in the human resources field. She says she’ll never forget her time at UIS. “My UIS experience has been the best years of my life,” she said. 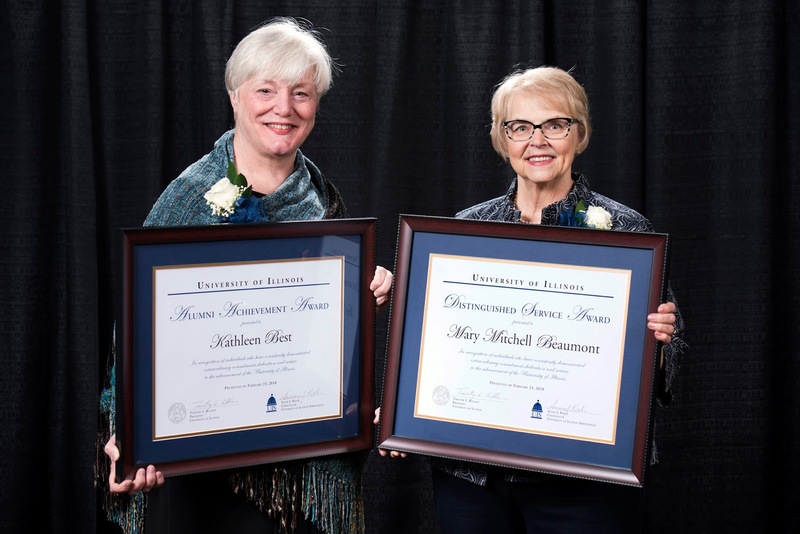 The University of Illinois Springfield honored the significant contributions of Kathy Best and Mary Mitchell Beaumont during the university’s annual Alumni Gala on Friday, February 23, 2018, at the UIS Student Union. The 2017 Alumni Achievement Award for outstanding success and national or international distinction in one’s business, profession or life’s work was presented to Pulitzer Prize-winning journalist Kathy Best, who earned a master’s degree in public affairs reporting in 1990. Best has covered news from the Statehouse to the Capitol, and from the digital domains of Seattle, Washington to the big skies of Missoula, Montana. Best grew up in a small-town Illinois newspaper family. Best didn’t sit for long. After a false start in pre-med at Illinois, she transferred to SIU-Carbondale and graduated in 1979 at the peak of a recession. Graduate school seemed like the best bet, and her parents, who knew public affairs reporting program founder Sen. Paul Simon and Statehouse reporter Mike Lawrence, recommended the public affairs reporting program. Her degree led her to covering the Statehouse for media company Lee Enterprises and the St. Louis Post-Dispatch. From there, it was a natural transition to the nation’s capital. “D.C. was a great place to work, but I missed feeling connected to a community,” Best explains. She was dating a reporter who relocated to Oregon, and on a visit, she fell in love with the state’s natural beauty. She arranged for a get acquainted cup of coffee at the Seattle Post-Intelligencer at 9 a.m., left the building at 6 p.m. and was hired an hour later. Best made her mark at the Post-Intelligencer’s rival, the Seattle Times, where she was hired as a managing editor for digital news because the editor said Best was the only person to have ever beaten him on a story. Under her watch, the Times staff won 2010 and 2015 Pulitzer Prizes for breaking digital news, and its investigative team won a 2012 Pulitzer for investigative reporting. Best became editor of the Times in 2013 and left in 2016 because she felt Seattle’s population boom had made it unlivable. Plus, the decline of legacy media meant drastic cutbacks. “I didn’t want to be the editor who dismantled the newspaper,” she says. The 2017 Distinguished Service Award for extraordinary commitment, dedication and service to the advancement of the University of Illinois was awarded to Mary Mitchell Beaumont. She earned a master’s degree in communication in 1989. Jim and Mary soon became fixtures at UIS. They frequented the library, attended art openings and auditorium events, and cheered at pep rallies and sporting events. Few things happened without them. When an event called for catering, Mary cooked. When WUIS, the UIS-related NPR affiliate, held pledge drives, she answered phones. “I’m proud to say I even judged a homecoming parade,” Beaumont says, laughing. Beaumont was a founding steering committee member of the SAGE Society, the University’s group for alumni and friends aged 50 and better. SAGE has offered “lunch and learn” events and dinners before Sangamon Auditorium events. As a longtime member and past president of the Springfield Branch of the American Association of University Women, Beaumont has promoted UIS’s interests. In recognition of her leadership, AAUW Springfield Branch established a scholarship in her honor that benefits UIS female students returning to their education after an interruption. The Beaumonts later endowed the AAUW scholarship and also established the Jim and Mary Beaumont Endowed Scholarship for Public Affairs Reporting. Beaumont also has been a champion for UIS causes dear to her heart. Jim—who died in 2013 due to an accident early in their marriage—negotiated the world from a wheelchair, with Mary as his primary caregiver. The couple advocated for accessibility on campus, as well as family-friendly restrooms. Mary also crusaded for the education and development of women as leaders. For more information on the awards, contact Chuck Schrage, associate vice chancellor for alumni relations, at 217/206-7395 or cschr1@uis.edu. Mel Clark admits to having “grown up a lot as a person” since enrolling at the University of Illinois Springfield. As a freshman, Clark got involved with the Gender and Sexuality Student Services Office, formerly the LGBTQA Resource Center. 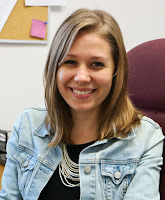 Now, as a senior on campus, Clark is helping to education fellow students. Clark is a member of the InQueery peer education team and works for Gender and Sexuality Student Services helping to plan events. The InQueery team provides workshops and other activities to classes and student groups in order to combat homophobia, transphobia and heterosexism. Clark, an information systems security major, chose the University of Illinois Springfield because the academic programs were recommended by a teacher. Clark grew up in Riverton, Illinois, only about 15 minutes from campus. Clark says the University of Illinois Springfield has come to feel like a second home. Clark regularly participates in events, such as LGBTea, a weekly social on campus where LGBTQ+ students can come together, share stories, support each other and have fun. Following graduation from UIS, Clark plans to earn a master’s degree in computer science at UIS. The student hopes to one day work for the FBI and help fight cyber-crimes.